In a newly published study, University of Washington researchers detail the first-ever accurate determination of a solid-state triple point in vanadium dioxide. It is well known to scientists that the three common phases of water – ice, liquid and vapor – can exist stably together only at a particular temperature and pressure, called the triple point. Also well known is that the solid form of many materials can have numerous phases, but it is difficult to pinpoint the temperature and pressure for the points at which three solid phases can coexist stably. Scientists now have made the first-ever accurate determination of a solid-state triple point in a substance called vanadium dioxide, which is known for switching rapidly – in as little as one 10-trillionth of a second – from an electrical insulator to a conductor, and thus could be useful in various technologies. “These solid-state triple points are fiendishly difficult to study, essentially because the different shapes of the solid phases makes it hard for them to match up happily at their interfaces,” said David Cobden, a University of Washington physics professor. Cobden is the lead author of a paper describing the work, published August 22 in Nature. In 1959, researchers at Bell Laboratories discovered vanadium dioxide’s ability to rearrange electrons and shift from an insulator to a conductor, called a metal-insulator transition. Twenty years later it was discovered that there are two slightly different insulating phases. 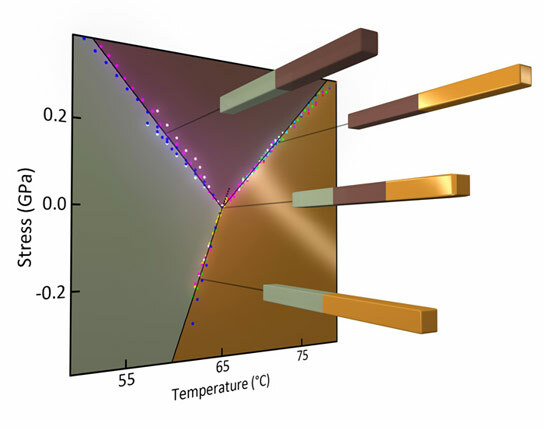 The new research shows that those two insulating phases and the conducting phase in solid vanadium dioxide can coexist stably at 65 degrees Celsius, give or take a tenth of a degree (65 degrees C is equal to 149 degrees Fahrenheit). To find that triple point, Cobden’s team stretched vanadium dioxide nanowires under a microscope. The team had to build an apparatus to stretch the tiny wires without breaking them, and it was the stretching that allowed the observation of the triple point, Cobden said. It turned out that when the material manifested its triple point, no force was being applied – the wires were not being stretched or compressed. The researchers originally set out simply to learn more about the phase transition and only gradually realized that the triple point was key to it, Cobden said. That process took several years, and then it took a couple more to design an experiment to pin down the triple point. “No previous experiment was able to investigate the properties around the triple point,” he said. He regards the work as “just a step, but a significant step” in understanding the metal-insulator transition in vanadium dioxide. That could lead to development of new types of electrical and optical switches, Cobden said, and similar experiments could lead to breakthroughs with other materials. Co-authors are UW physics graduate students Jae Hyung Park, T. Serkan Kasirga and Zaiyao Fei; undergraduates Jim Coy and Scott Hunter; and postdoctoral researcher Chunming Huang. The work was funded by the U.S. Department of Energy. Be the first to comment on "Physicists Pinpoint Solid-State Triple Point in Vanadium Dioxide"